Car Rental Guide for online car rental & car hire in Bloemfontein, South Africa. Competitive car hire rates. All vehicle types - sedan, 4x4, SUV, minivan & pick-up. 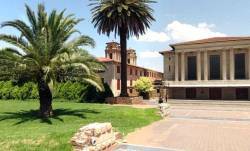 Bloemfontein, the Capital City of the Free State Province in South Africa, is centrally situated roughly in the middle of the Province, as well as in South Africa. The "City of Roses", as it had become known locally, is placed with more pivotal importance than any other city in the country. The Judicial Capital, sixth largest city in South Africa, lies on the main road, rail and air links between north and south, east and west. The atmosphere that one feels in Bloemfontein, this heart of the Free State situated in the central highlands, is one based on an appreciation of family values, where quality of life is of prime importance.